In order to prepare hardware, software, protocols, and human beings for space, space agencies are first testing many of these things in another extreme environment by sending them undersea. 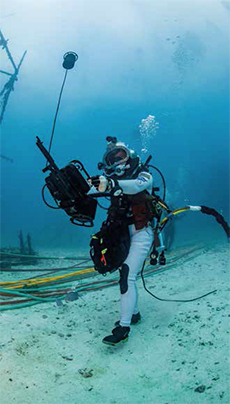 Living on the bottom of the Atlantic Ocean, the NASA Extreme Environment Mission Operations (NEEMO) evaluates tools and techniques being tested for future space exploration by living in simulated spacecraft conditions and conducting simulated spacewalks outside of their undersea habitat. This past summer, the 21st NEEMO crew and two professional habitat technicians lived in saturation at 62 feet (19 meters) below the surface of the Atlantic Ocean at The Aquarius Undersea Reef Base, owned and operated by Florida International University under permit by NOAA and the Florida Keys National Marine Sanctuary.